Lentil soup is one of my go-to recipes. It only takes about an hour to cook. And it has infinite varieties. 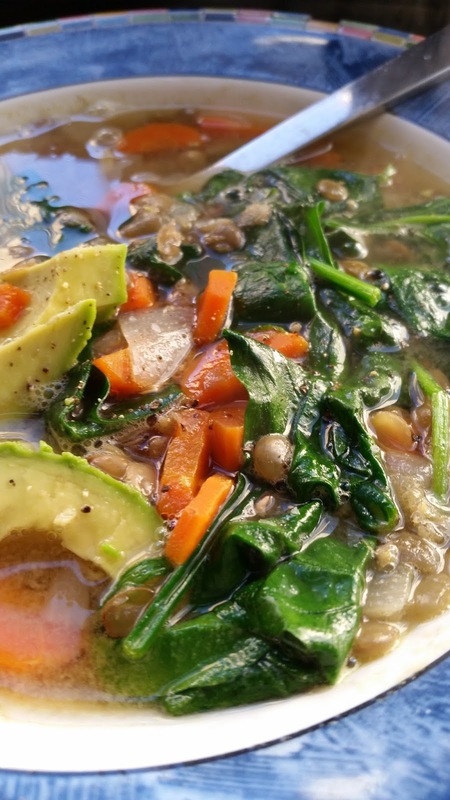 This week, my lentil soup includes spinach, a squeeze of lemon and a half a perfectly ripe avocado. Here’s the recipe. Makes 4, 1 cup servings. In a large heavy bottomed pot on medium heat, sauté onions in olive oil until translucent and fragrant (5-7minutes). Add in garlic and ginger and sauté for 2 minutes, also until fragrant. Then add carrots and sauté the whole lot for another minute or two. Add lentils and bay leaf, stir into veggie mixture until coated and mixed through. Add 8 -10 cups of water and one teaspoon of salt (you can add more salt and/or water as needed). Bring the whole mixture to a boil and then simmer for 45-minutes to an hour until lentils are tender. Adjust seasonings i.e. add more salt and freshly ground pepper. When you’re ready to serve, add your favorite greens and warm through by stirring into the soup still simmering on the stove. It will only take a minute or two for the greens to cook and brighten; that's when they are at their best. This step is crucial: if you cook greens with this soup (which you can absolutely do) they tend to get soggy, overcooked and sad. You want bright green, happy greens like you see in this picture. A squeeze of lemon brightens the whole dish and lemon (any citrus) helps the body digest the nutrients in green veggies. Avocado is perfect on top: a smooth, cool texture on top of hot and hearty. Also, because it’s a vegan, almost fat free soup, the healthy fat in avocado will help you feel full longer.